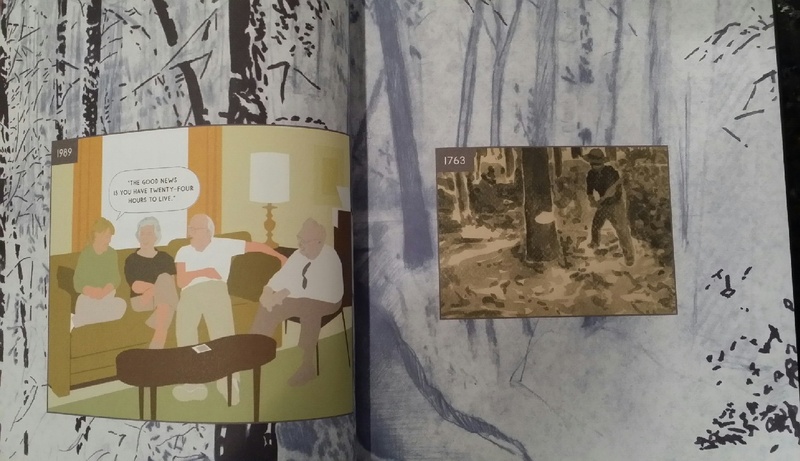 If you casually flip through Richard McGuire’s new graphic novel, it won’t take long to realize the same view of one corner of a living room is the story. It’s about the events that take place in that space over thousands of years. 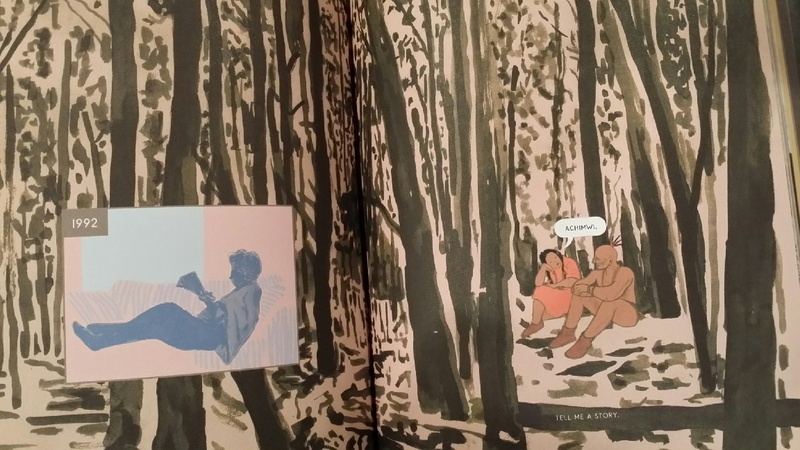 Each two-page spread depicts the corner, with a window on the left and a fireplace on the right, at different moments throughout time. The room’s decorations change according to the trends of decades, as do the hairstyles and clothing of the people. Some of these people reappear throughout the book, their emotions and moments captured and sometimes played out in mini stories. 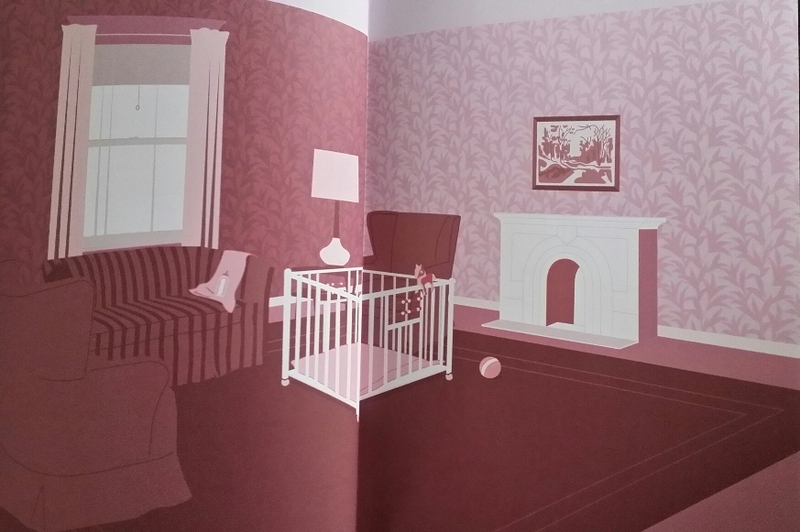 The upper corner of the left page states the year of the living room. Windowed time capsules layered over the main illustration reflect past and future events that have and will occur in and around that very corner of space. Sometimes the living room isn’t even present, illustrating time before the house existed, such as in prehistoric and colonial times, as well as after the house disappears in the future, when rising waters of climate change roll in, or after the earth is destroyed and a new one begins. This is not as much a book to read as it is to experience, turning the pages and pouring over the history of one space throughout time. 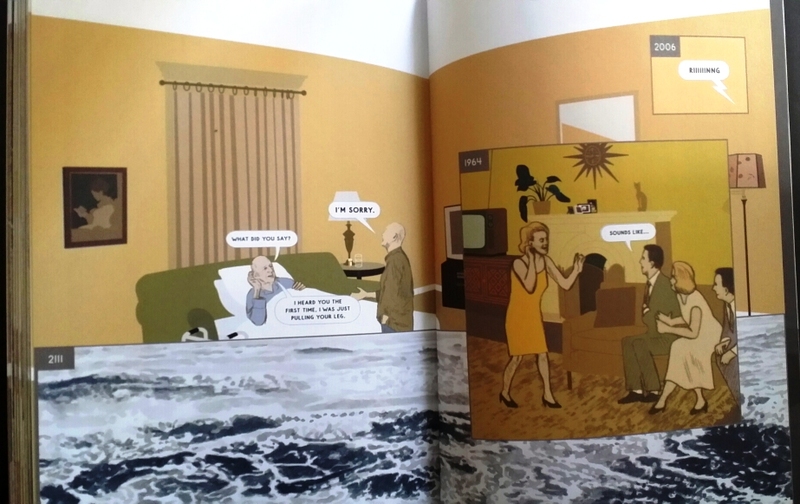 Richard McGuire began this project 25 years ago when his first iteration of the concept appeared in the comics journal Raw, co-edited at the time by Art Spiegelman, who is best known for his Pulitzer Prize-winning graphic novel Maus. According to an article in The New York Times, the concept moved toward development into a book, but Mr. McGuire couldn’t make it work and put away the project. And then, the death of his parents and an older sister “brought him back to the project with renewed energy and a mountain of source material.” The living room is from his childhood home. In some illustrations, reactions or occurrences in one year reflect an event in the past, such as in this one below, where a woman in 1992 is reading on the sofa by the living room window, surrounded by a forest that populated the space in 1609. In the forest, a woman says, “Tell me a story,” to her companion. In 1763, we see a man chopping down a tree in the forest, which eventually will be replaced with houses. In 1989, a family member is telling a joke that in an abstract way relates to the loss of the trees. During colonial times, a brick house existed on land across the street from Mr. McGuire’s 20th century suburban house. Ben Franklin makes an appearance at the colonial residence in one of the mini stories. In 1783, the house burns down. 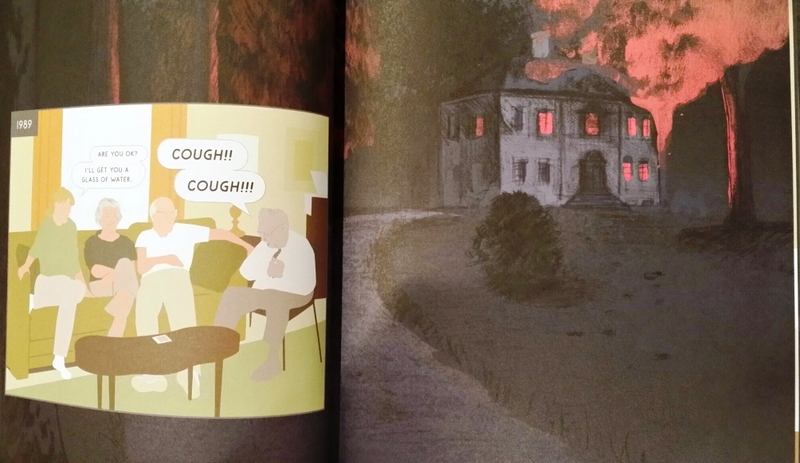 In the overlay of time in the living room, 1989, a man has a coughing fit, as if reacting to the smoke. The illustrations span a time range of 3,000,500,000 BCE to 22,175. In between, emotions of sorrow, joy, confusion and happiness play out, as well as experiences of birth, accident and death. Below, in 2005, a family member is losing his hearing while in 1964, a group plays a game of charades (“Sounds like,” the man says); in 2111, ocean waters swirl where once the house stood; and in 2006, a phone rings that nobody answers. The Morgan Library & Museum exhibited Richard McGuire’s work this past fall. “Sharing a Sofa with Dinosaurs,” an article in The New York Times, provides a slide show from the exhibit that gives an idea of how Mr. McGuire put the book together. 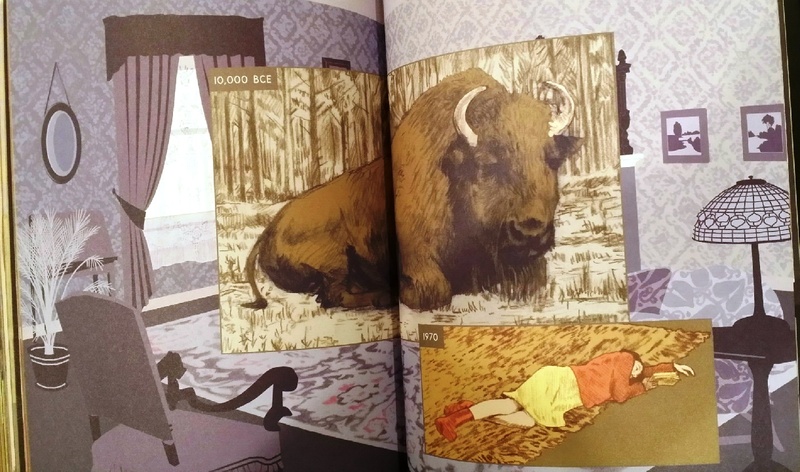 He’s done it with such a seductive draw that it’s hard to stop turning the pages, creating a need to keep observing the fascinating life details as they unfold. You’ll come away thinking differently about a room you live in, specifically what happened in its space years before you ever existed — and what will happen years in the future, after you’re gone. I am so glad you reviewed this book. I was intrigued when I saw it in the NY Times. This might be one of my first “reads” in the New Year! Happy holidays! It’s a good one, and beautifully produced, also. The price is high at $35, but it’s a book you’ll pick up several times — and so will others, if left on a table in a common room. Have a great New Year!